The health of your bones is an essential component to your overall wellbeing. It supports your daily activities and decreases the risk of injuries and fractures. Bone density can decrease with age, and making sure that you maintain strong and healthy bones will support the aging process. Although exercise contributes to bone health, proper nutrition must also be implemented for lasting results. Nutrition and Bone Health Vitamin D and calcium are the primary nutrients related to bone health. These nutrients are critical for the development of bones and teeth. They’re even more important throughout the aging process. Osteoporosis can commonly develop in older individuals, leading to a decrease in bone density and a greater risk of fractures. The amount of calcium and vitamin D needed for healthy bones increases after the age of 50. 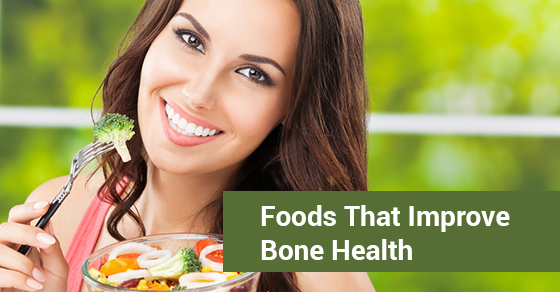 The following are 3 foods to eat for better bone health. Dairy Dairy foods are a main source of calcium. Also, many dairy foods are fortified with additional vitamin D, which aids in the absorption of calcium. Yogurt, for example, can provide 30 percent of a person’s calcium needs. Fish You might not associate fish with bone health. But foods like sardines and salmon are great sources of calcium and vitamin D. Salmon also provides omega-3 fatty acids, which support heart health and can provide more than 100 percent of your daily vitamin D.
Vegetables Calcium is present in many vegetables. Dark leafy greens are a great source of calcium. These include foods such as kale, collard greens, and bok choy. You can get up to 200 milligrams of calcium from just a cup of cooked greens. In addition, many dark leafy greens are good sources of vitamin K, which has been shown to decrease the risk of osteoporosis. Cooked spinach can provide you with about 25 percent of your calcium intake needs while also providing your body with vitamin A, fiber, and iron. In addition to these foods, you should aim to eat a balanced diet that’s based on natural whole foods. There are many factors that influence your calcium intake and your body’s ability to absorb and utilize it. By eating a healthy diet combined with adequate physical activity, you’ll provide plenty of support for the health of your bones and prevent common health issues that can impact your daily living. Knowing the sources of calcium and vitamin D makes it easy to choose the right foods for the long-term health of your bones.